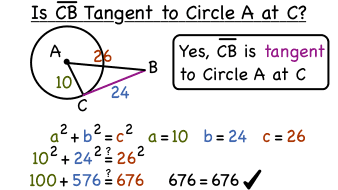 In this tutorial, you'll see how the Converse of the Pythagorean Theorem is used to figure out if a line is tangent to a circle. Think your triangle is a right triangle? Want to be sure? If you have the length of each side, apply the Pythagorean theorem to the triangle. If you get a true statement when you simplify, then you do indeed have a right triangle! If you get a false statement, then you can be sure that your triangle is not a right triangle. Check out this tutorial and learn how use the Pythagorean theorem to see if a triangle is a right triangle! The converse of the Pythagorean Theorem is like the the Pythagorean Theorem in reverse. You can use it both forward and backward! Not all theorems work this way, but the Pythagorean Theorem does! This tutorial will show you how to use both the Pythagorean Theorem and its converse. What does it mean when a line is tangent to a circle? In this tutorial, you'll learn what a line needs to do to be a tangent line to a circle.